A few years ago, a situation with one of my kids threw me for a massive loop. One of those moments where time screeches to a halt and nothing makes sense. Fear, worry, and angst were only a few of the emotions dehydrating my spirit. Even prayer wasn’t a strong enough IV drip. Perhaps I wasn’t listening, but nobody told me when I became a mom how hard raising bigs can be. Maybe because doing so would have set me up for decades of ulcerative colitis. The early years stir up enough stress because, head bumps, lost blankies, sibling tiffs, fevers, hangry whines, hurt feelings from peers. But then our kids grow up, causing more difficult and challenging situations to creep into the family dynamic: mental illness, broken hearts, faith crises, addictions, and other adult issues. Such heavy and heart-wrenching scenarios can leave us frozen in fear; stifled by the weight our children’s broken world. And if we are dealing with similar types of brokenness as adults, woe to all involved. So how do we find the resolve to endure big-time pain in our mom hearts when we can barely manage to handle the frazzle of everyday living when kid problems are minor? Well, I can tell you when I was a young mom I never pondered such questions, mostly because I didn’t have the energy. And does God really want us to think too far forward anyway? Projecting fear and worry based on potential circumstances or scripting how we will respond to this or that is trying to control an illusion. Only God knows the path for our kids and for us as parents. Turns out He fills up a Franklin Planner for our lives way ahead of time, i.e. before we are bornish. So, I guess no use trying to role play the what ifs based on our limited human understanding. Even though God tells us not to worry about tomorrow (Matthew 6:23-28), shouldn’t we at least have a game plan or a battle strategy for how we will handle the problems we know our kids will face some day? I believe the answer is yes. And God tells us so by reminding us how vital it is for us to trust and surrender in the now. To not worry and fret over a possible future, but believe in His provision and protection at every step. We have plenty of training ground because raising kids in today’s world stinks to high heaven. Thank you. Not thank you. And being a mom during seasons of personal unrest and uncertainty with our kin is brutal. Trusting God in every situation feels impossible some days. We don’t want our precious babes to feel pain. Their sadness, confusion, struggles can weigh on our mom hearts to no end. So, when our job is to protect them from evil, keep them safe, ensure their well-being, how do we let go and let God when trouble befalls them? I think the only answer is we do the best we can. Because that’s what God asks of us and He promises to Light the way at every step. Our kids are His, not ours. And the sooner we realize and accept this, the better equipped we are as our kids morph into independence and set foot in the scary world without us. Such a mindset requires resolve, endurance, and perseverance. All character traits that emerge when we practice surrendering our kin to God on the regular. If you are raising littles now, I promise that a willingness to surrender the small stuff during these formative years is a heavenly gamble with a guaranteed future pay off. Put all your chips on the color Divine, let God roll the dice, and the jackpot of peaceful endurance is yours for the taking Click & Tweet! I know this because I didn’t follow this advice as well as I could have as a young mom. So, when my kids got big overnight and life began wreaking havoc on their tender hearts, my mom heart became ensnared in the barbwire of perpetual fear. Only in the last few years have I been able to free my soul from the debilitating stronghold. God used spiritual tin snips in the form of a heavenly song to begin the process. 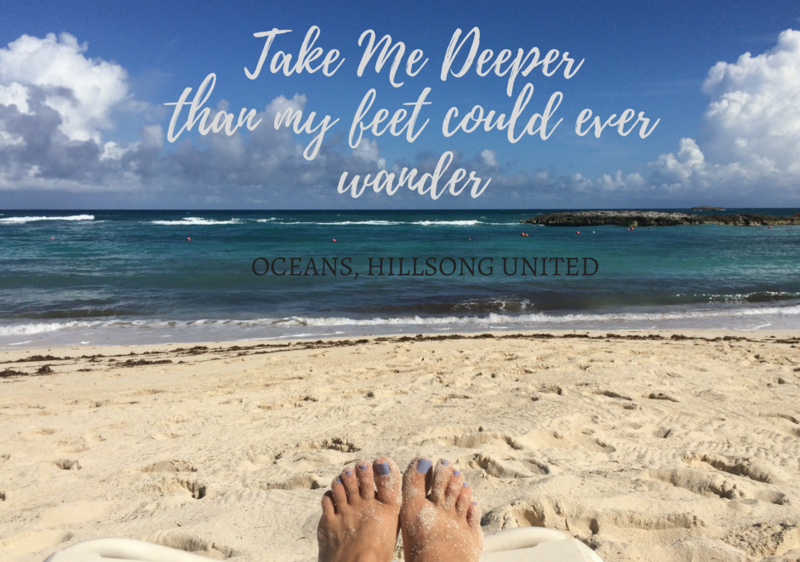 A song which I heard on the radio shortly after my mom heart got all wound up a few years back: Oceans by Hillsong United. These words continue to buoy me to this day as I journey along as a mother trying to let go and trust God with the welfare of my adult children. It’s not easy. But it’s not impossible either. God knows how to take us deeper than our feet could ever wander. We just need to believe and keep breathing as he guides us further away from the shore. Gosh, Shelby, reading that makes me feel like you know EXACTLY what I’ve struggled with and your empathy and offering of help comes through like a huge, bouying hug. I loved: “If you are raising littles now, I promise that a willingness to surrender the small stuff during these formative years is a heavenly gamble with a guaranteed future pay off.” My head was nodding something fierce. Thank you for that heart dump, it was definitely the color divine! One thing I know for sure is God’s timing is always on point. He not only buoys us through deep waters, but knows exactly when we need to see the shore. Thank you. So sorry to hear that, Janell. Makes my mom heart ache. And yes, we often have to tread unfavorable waters. Thank goodness God is our buoy. Hugs back.